That's a question best asked of the Memphis Redbirds. I'm not sure. Sorry. OBP will govern whether Fowler has a good start, not BA or even OPS. He's got to get on base for this offense to work at its best, and for Goldschmidt, Ozuna, and DeJong to get their chances with runners -- plural -- on base. If Fowler is around his career OBP, then he's delivering for the Cardinals. Hi Derrick, Love the chats. I am excited by this team but admit the poor showing on offense this spring is worrisome. Any thoughts? I hope the Cards and their fans don't regret not signing B Harper. Not only are none of the outfielders not hitting, he would be the long term solution. With Ozuna leaving, we'll be looking for another outfielder for next season. What are the Cards plans for this situation? Tyler O'Neill. Lane Thomas. Or, and here's the noteworthy one, Dylan Carlson. With the Yankees hurting for pitching, have they made contact with the Cardinals about their excess pitching? With some of them out of options this year, I would hope they could get something in a trade instead of losing them through the waiver process. That has not come up, no. The Cardinals expected to be active in such talks this spring, but as the month has played out there has been injuries that have changed that view, changed the number of players the Cardinals have to move, and changed any issue with options they might have. Cardinals see a spot in the bullpen for Gant, they see an opening in the bullpen for Shreve now with Cecil out ... and Mayers had won a spot, it seemed. Gyorko hasn't been playing, so that's not a move that has been explored really. Derrick. haven't seen much of the players on TV, but you've seen everything up-close. Can you give an eye-test evaluation of some of the guys that aren't hitting? Is this just a case of guys still tinkering, maybe hard hit balls that just find a glove, or timing is just not there yet? I know ST stats dont mean much, but we are coming out of the back stretch for ST and Opening Day is in sight-and then we have a near-no-hitter..yuck! Thanks for everything! Let's do some bullet point thoughts on the hitters and things you cannot see in the box score: Ozuna looks like his timing/balance is off. He's ahead of pitches, behind them, La Russa used to call this caught in between and his most ferocious swings aren't connecting. 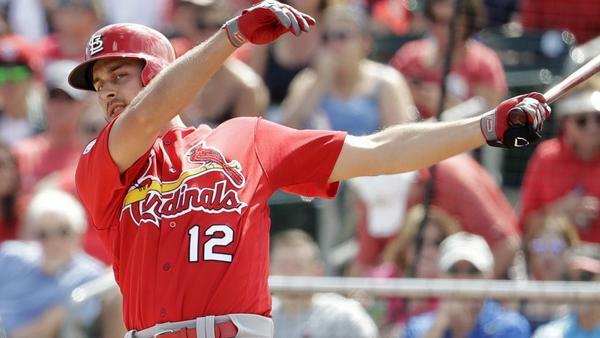 ... Bader is working on his approach, and has been caught between the type of hitter he's going to be at Nos. 7 or 8 in the lineup. He didn't take the bunt single offered by Miami on Sunday. That probably won't happen again. ... Fowler has harder contact here in the past week than we saw at any point in time this past season. He looks comfortable at the plate, with a bounce, and he's swinging the bat, not the other way around. ... DeJong has started driving the ball. Not sure how much selective he's going to be around the strike zone. He's working on that eye. ... Before his sore back, Carpenter was sharp. ... Goldschmidt was really thrown off by Richards' changeup, but what righthanded hitter wasn't? Goldhschmidt arrived ready to hit and with the exception of Sunday hasn't looked any different in the games. ... Molina, same old same old. ... Kolten Wong appears primed for a strong season. He's more confident and comfortable in his play and at the plate then I've ever seen him. No longer looking over his shoulder, no longer wondering if he hast to hit homers to play, and he's just going along, strong. ... Pena has done well at the plate. ... Robinson coming around. Munoz nails fastballs. ... That's a good tour, right? Ozuna shows up overweight, still looks overweight, doesn't throw well, steps toward 3rd base everytime he swings and is hitting .133 this spring. Also, he dogged it yesterday on a lazy fly ball to left that fell right in front of him for a single. He seems like he's on another planet. Meanwhile, O'Neill just hit his 5th HR of the spring. How long will the Ozuna experiment last before he's traded? Cardinals explored this possibility in the winter, and if this season goes upside down -- or his goes upside down -- they'll have these talks again closer to July and the deadline deadline that comes at the end of it. The team has had some frustrations with Ozuna. They wear that on their -- ahem -- sleeve. But there's been a sense recently from people who have spoken to Ozuna or are around Ozuna that he's taken that frustration to heart and realizes what awaits him at the end of the season if he puts things together, if he commits to what the Cardinals want from him and the talent he could possess. His fitness is stronger than it was a month ago, for sure. The arm is healthy enough to unleash a throw. We've seen that. Confidence has to arrive, it seems. Your tour bypassed Mr. Wieters. Any insights there? Not much. He's had good games. He's been solid behind the plate. At the plate, he's been alright. Do you think that the new hard trade deadline will force teams to be more decisive about their internal evaluations of their rosters? I wish. I worry that the new, hard deadline won't really do much at all. It's too early. If they're going to have a hard deadline they need to move it back to August, even late August because by the end of July you're only going to have the teams we already know were out of it (the tankers) and the teams who think they're in it. What's changed? All that would change is the tankers dump players via trade, possibly, and go into the final two months with a team of youngsters? How are they going to sell that? It leaves the worst teams possible all the more worse for an ENTIRE TWO MONTHS OF THE SEASON. And it leaves fence-sitters to sit the fence for another two months. And so on. On July 31 in 2018, there were 11 teams in the NL that were within 7 1/.2 games of a postseason berth. Eleven. Who are the sellers that market? The Marlins. They already sold off all of their outfielders. The Mets. The Padres. The Giants. Who did they have that they moved? See, I think a hard deadline that didn't move back may only be a staring contest. I hope I'm wrong. If more teams compete, I'll be wrong. I'll be surprised, and wrong. What do you think the team is realistically hoping out of Wacha this year? An All-Star summer, Cy Young award votes, 200 innings, 18 quality starts, another NLCS MVP, and a compensation draft pick when he signs elsewhere. Grave? He's not dying, guys. Biggest "X Factors" this year are Bader and O'Neill. Agree or disagree? There's a cardinal that's been flying straight into the window by my cube all morning, Should I regard this as some sort of omen for the coming season? Yes. It's a harbinger of what's to come. Edman supposed to start today I thought, but was a late scratch. Anything to be concerned about? We are efforting an answer. Rick Hummel suggest that maybe the Yankees traded for him. He's kidding. Hummel is Edman's biggest advocate in camp, even recently stumping for him in the coaches office as part of the group that should be considered if Gyorko starts on the IL. Will get you an answer later in the chat, promise. Is today’s lineup something we’ll see when camp breaks? Goldy-2 DeJong-3? Could be. Shildt is tinkering, experimenting with this look. Dakota Hudson has shut out the Phillies through five innings. He's the fifth starter, hands down. This has been a remarkable start by Hudson, and really a spring worthy of applause. He saw an opening in the rotation -- and he has done more than anyone to seize it and make it not a question at all. Seriously. The question is whether he starts in Milwaukee or Pittsburgh. None. After the amateur draft? 5 IP, 4 H, 0 R, 1 BB, 8 K, 79 pitches, 48 strikes. -- Hudson's clincher. Hudson looks like he could be the answer for the 5th spot. Gomber has struggled this Spring unfortunately. Is Gant a possible trade piece? The inadvertent Jeff Francis comment made me chuckle. He was one of the worst hitting starting pitchers in the league. I also recall some banter about him coming to the Cards as one of Dave Duncan's reclamation projects but it never happened. That was something the Cardinals discussed. He also was in the crowd for one of those playoff games in the 2004-2006 run. Cannot remember which one off the top of my head. But he bought a ticket on a whim as he drove home from Colorado. Would Edman's defense be better than Robinson or Munoz? Depends on the position, honestly. There can't be many Cardinals who have had a more impressive spring than Jack Flaherty, can there? He has looked to be in prime form. Is there a feeling he could be the next super star developed by the Cardinals? It's a short list, for sure. It might be Hudson ... and then Flaherty. Leone has done well, too. Hicks when needed has pitched well. Kolten Wong has quietly had a strong spring.